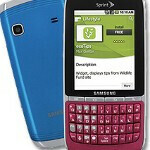 We recently reported that Sprint would introduce on April 15th, the eco-friendly Samsung Replenish. The Android flavored device was expected to launch on May 5th. Today, a day earlier than Sprint's expected announcement, the Korean based manufacturer let the cat out of the bag by introducing the model on its web site. With a QVGA display 2.8 inches in size, the Replenish is constructed from recycled and recyclable plastics. Not much is known about the phone when it comes to specs, although the handset will have a camera and offer Wi-Fi connectivity as well as Bluetooth 3.0. Samsung's web site said that the unit will be launched in June. Any more information on the Samsung Replenish will need to wait for Sprint's announcement tomorrow as Samsung has removed from its site the page with all of the information about the Replenish. The colors remind me of the LG dLite. Overall though this is a really good idea. A lot of teens want to be green but want a smart phone as well and have personality and I think this fits it all into one. Well done Samsung. why in the hell would it run 2.1? 2.1 is ancient, everybody's on board with 2.2 now, and it has better performance. I would only see it being 2.1 if Samsung wants a lot of customer complaints about the OS and potential recall risks that a lot of low powered 2.1 handsets have experienced. I do hope that it's two different color schemes. Otherwise, what an ugly phone. Reminds me of my old Verizon Samsung Saga WM phone, which was really a pretty good phone, but had a rather awkward form factor, being rather too long - oh, and it was blue. If people want white phones (ugh! ), I can't fault this one on color.